Enjoy a more productive classroom with this fun and easy-to-implement program for K-5 students. Start the game and project the scoreboard. Teach your lesson as usual. Referee the game by awarding bonus points and penalties. Reward high scoring students throughout the day. 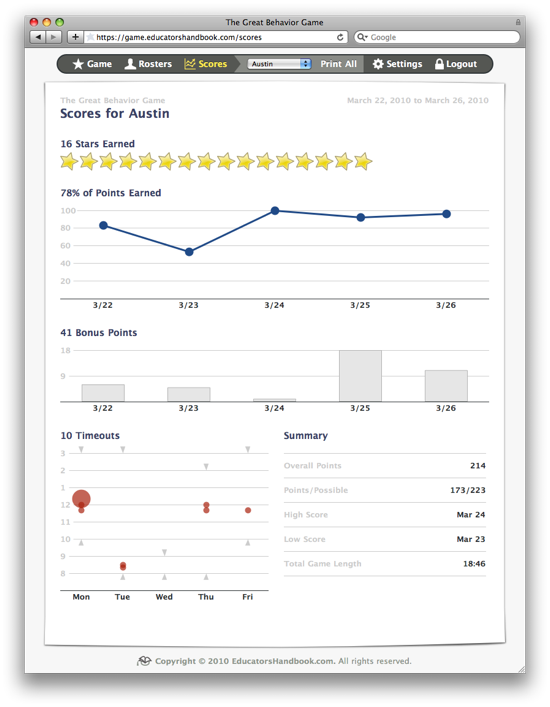 When you start the game, your students will begin automatically earning points. 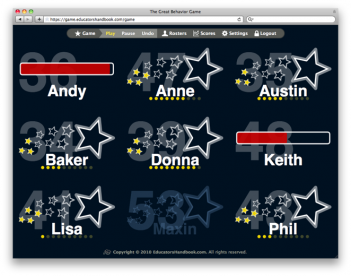 Special points – stars – will be awarded every ten consecutive points. Single-click a game piece to award a bonus point for appropriate behavior. Click-and-hold a game piece to assign a timeout. A red progress bar will count down the time remaining. During timeout, the student will not earn points and his or her progress toward the next star will start over. If the need arises, click the game piece during timeout to restart the counter. 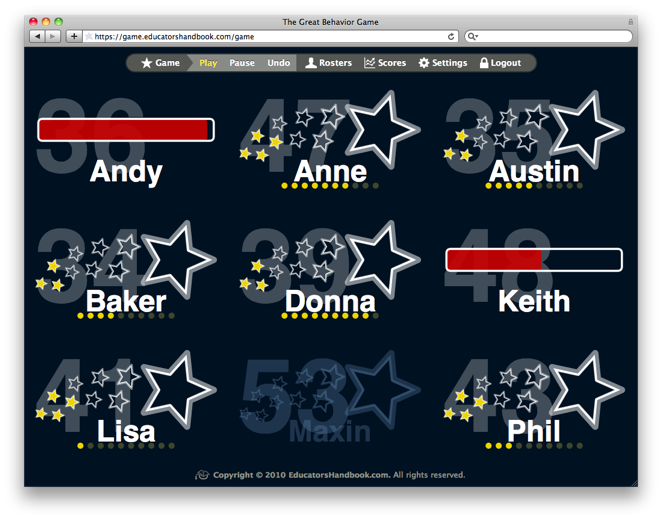 The Great Behavior Game keeps track of the score so you don’t have to. Create reports to help you troubleshoot student behavior, communicate with others and measure Response to Intervention. Change the conversation about student behavior by incorporating rich reporting into the discussion. See the Understanding Scores Worksheet for a complete explanation of game scoring and reporting. 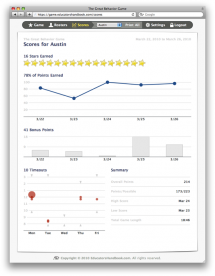 Incorporate student scores into your daily routine and recognize student achievement throughout the day. 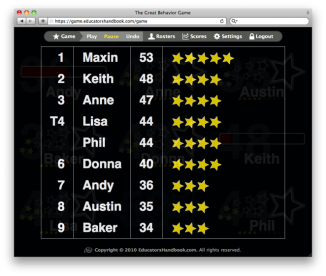 When you pause the game, the leaderboard displays each student’s scores relative to his or her peers, which encourages competition and allows you to reinforce high performing students. 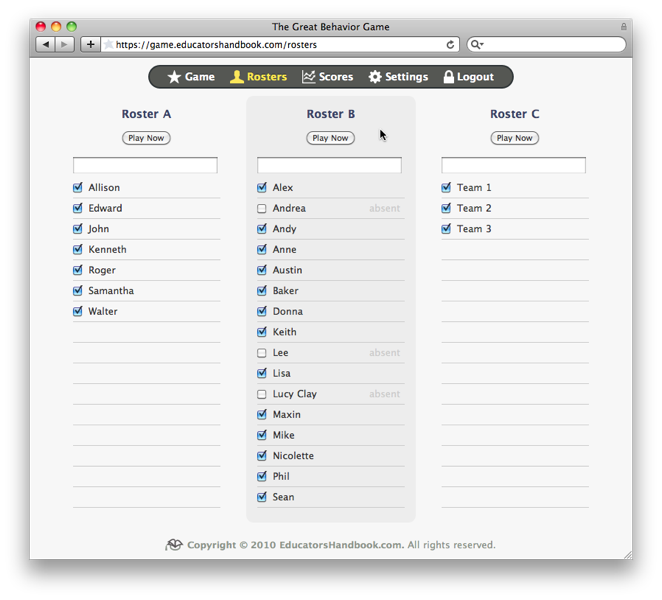 The Great Behavior Game allows you to manage up to three different rosters of students. 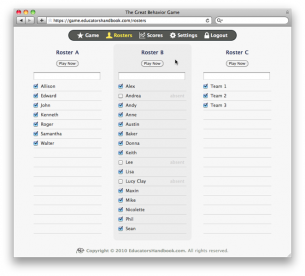 Quickly switch between rosters and indicate which students are in attendance. If you perfer team play, use a roster to create teams. 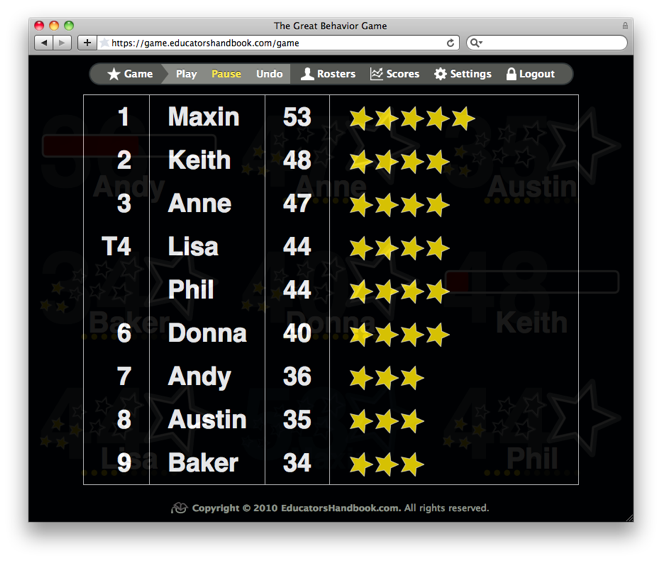 The Great Behavior Game does not require any special software or plugins — it runs completely in your web browser. For the best experience, ensure you are using a modern web browser and an LCD projector during game play. The Great Behavior Game is supported by five decades of research on student behavior. Below are a handful of the research studies that inspired its development. Barrish, H. H, Saunders, M., & Wolf, M. M. (1969). Good behavior game: Effects of individual contingencies for group consequences on disruptive behavior in a classroom. Journal of Applied Behavior Analysis, 2, 119-124. Austin, J. L., & Soeda, J. M. (2008). Fixed-time teacher attention to decrease off-task behaviors of typically developing third graders. Journal of Applied Behavior Analysis, 41, 279-283. McLaughlin, T. F., & Malaby, J. (1972). Intrinsic reinforcers in a classroom token economy. Journal of Applied Behavior Analysis, 5, 263-270. Foxx, R. M., & Shapiro, S. T. (1978). The timeout ribbon: A nonexclusionary timeout procedure. Journal of Applied Behavior Analysis, 11, 125-136.